After two days of travel from San Francisco, Dave and I boarded MV Oktavia at the port in Khao Lak in south Thailand, on the Andaman Sea. 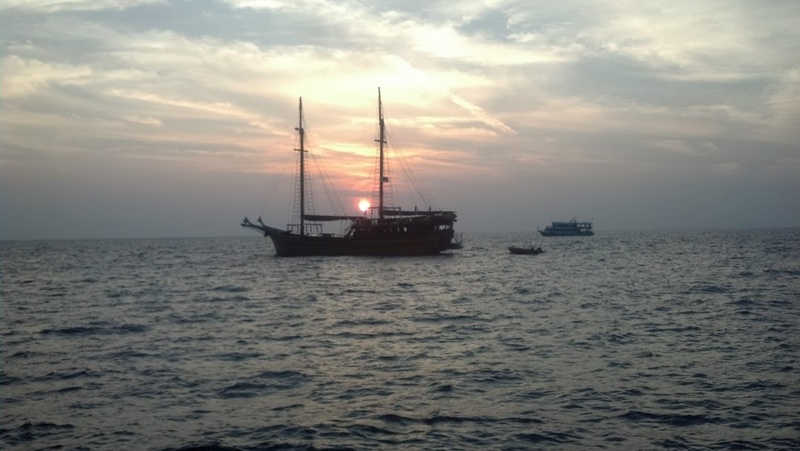 Oktavia, the largest live-aboard diving ship on the Andaman, was headed to the Similan islands for five days. Experienced divers prize this archipelago for the biodiversity in the coral reefs on the eastern side of the islands (protected from the Indian Ocean) and the larger marine creatures that also prey there: the barracudas, manta rays, whale sharks, moray eels, sea turtles, octopi, cuttlefish, sea snakes, scorpion fish. 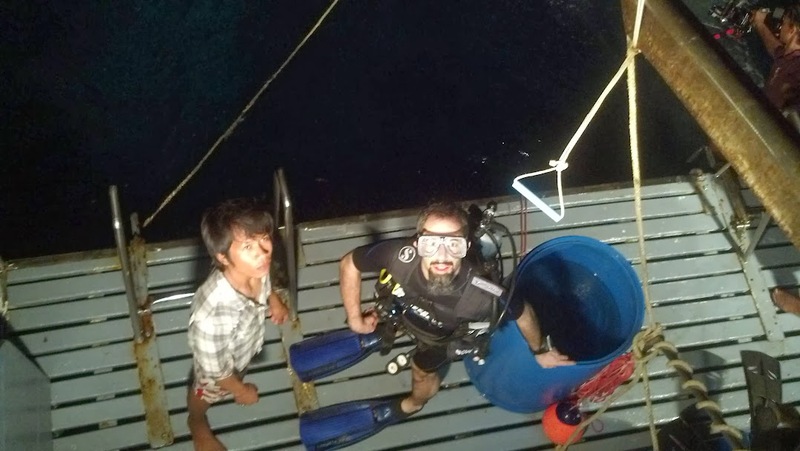 During the five days on board, Dave more than doubled his diving record. I snorkeled three-four times a day, and thanks to the experience of my guide, Aey, was able to spot nearly as much as the divers: though I didn't see the bottom-feeders, the cuttle fish, the octopus, I got very friendly with the turtles, the barracuda, the schools of fusiliers, and a few eels. For more pictures and stories, check out Dave's blog. Boarding the ship for five days was a disorienting experience. Though Oktavia was large for the area, it was about three times smaller than the previous ship we'd stayed on (when two years ago Dave dove in the Great Barrier Reef off the coast of Australia). It had three passenger decks (including the dive deck and the rooftop sundeck), and filled to maximum capacity for the Christmas holidays, housed twenty-two passengers, six diving staff, and six boat staff. The co-owner of the company, an expat from Sweden, supervised the departure in the port, but didn't himself go on board. All six of the boat staff were locals and also one of the dive staff--Aey, assigned as my snorkeling companion. The rest of the dive guides were expats from Serbia, Germany, Belgium, and England. They were well matched with the passengers: one German couple, a French couple who lived in Singapore, a Swiss man, an Israeli woman, one couple from Hong Kong, one couple from India, a man from Korea, and four couples (one with teenage daughter) of American military stationed in Okinawa. And us: Dave and I had traveled the longest to get to the Andaman. We were also the least experienced. Most people on board had clocked hundreds of dives over many years; diving for them was a weekend activity. Dave held his own and earned the advanced PADI certification during this trip, allowing him to go on deeper and more adventurous dives. I came up with a dozen new answers to the question why I didn't dive (none of them very good). The indoctrination to life on board began on dock. We were asked to put our shoes in a large crate--they were promptly stowed away somewhere, and we didn't see our sneakers and flip flops again until the end of the five days. From then on everything we did--hanging out at dinner, going to the bathroom, to our cabins, to bed, we did barefoot. Boat rules (shoes are a liability when it's rocky) seemed combined with Thai culture: Thais take off shoes when entering living quarters. At the airport in Phuket, I watched as a cleaning woman took off her shoes before entering the women's bathroom to clean, upending all of my notions of hygiene. At a public bathroom on one of the Similan islands, the entrance to the bathroom was blocked by a deep basin for feet: day-trippers were encouraged to leave their shoes on the beach, and rinse feet on both entering and exiting the bathroom. Thais also don't use paper for wiping, and so every stall was outfitted with a special hose for washing up. Luckily, there was plenty of toilet paper for the foreigners on the boat, though it got pretty wet, especially on the first day or two: bathrooms on the boat also served as shower cabins, and after every dive or swim we used them to rinse off the salt water. This, I supposed, helped to keep the bathrooms clean. I stopped cringing on the third or fourth day aboard. The divers meant serious business. The amount of time they could spend underwater was strictly regimented by their exposure to nitrogen; within that they maximized their diving opportunities. At 7 am people assembled in the common area for early breakfast (toast and/or cornflakes with bananas, Nescafe or Lipton tea) and dive briefing. At 7:30 am they started putting on their gear and set off for 45-60 min underwater. By 9 am they were back and the breakfast was served: bacon, chicken sausages and nuggets, eggs. Fruit--pineapples, watermelons, apples, lychee, bananas--was available with practically every meal. At 10:30 am, the second briefing began, and by 11 am the divers set off for the second dive of the day. That was followed by "snack" at 12:20 pm--the most desserty meal of the day. One day this was rice porridge with coconut milk; on other days we had pancakes, fried bananas. After an hour-long break, the third dive commenced around 2 pm. Lunch was served at 3:30 pm--a heavy meal with fried pork or chicken and a Thai curry and coleslaw. The chef always made a veggie curry for Dave, one of the two people on board who didn't eat meat. After lunch, divers were given the long two hour break. On the two first days, the crew organized shore trips: the ship's dinghy took us to shore of Similan islands 4 and 8 (the largest). We went on short jungle walks, spotted some very rare pigeons that looked a bit greener than city pigeons (fish people are NOT bird people), mingled with large crowds of Russian day-trippers, and lingered on the beaches of fine white sand. 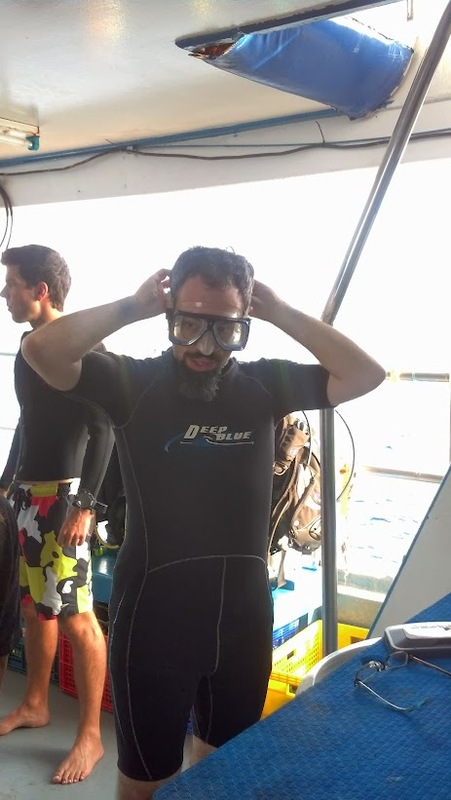 On the other two full days at sea, the boat was moored away from inhabitable land, so one time Dave went snorkeling with me. Snorkelers, he confirmed, saw the large picture: like getting the bird's eye view of the landscape that divers were able to explore in greater detail. The last dive of the day took place just before or just after sunset: the sunset or the night dive. Divers were equipped with flashlights and took off around 6:30-7pm to look for crawlers: the shrimp and the crabs and other shellfish that could be easily spotted when the light reflected from their eyes. For me, this was a reading and writing break: I took notes for future stories. 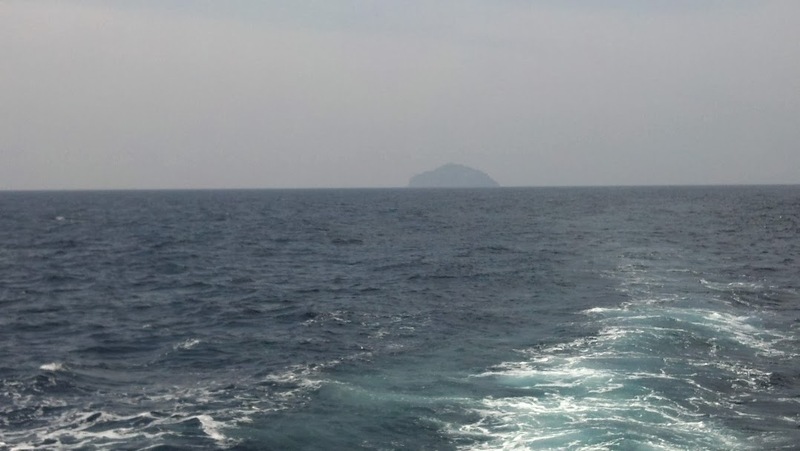 The social dynamics between all the passengers and the staff of the diving boat were fascinating; the mixes of cultures and languages and occupations and social classes all brought into play as people were forced to mingle in the constraints of the diving ship. More on that to come. The divers returned to the boat in time for dinner, served at 8 pm sharp. They shared a beer or two (alcohol and diving don't mix; after drinking a single beer a diver is disqualified for the rest of the day), exchanged pictures they took during the day, and then quickly dropped off to their cabins, dead tired, to sleep.